With the New Year upon us, many of us have a desire to "get into the Word." I'm with you. There are many good reading plans to help guide you in this pursuit. But this year I'm coming at it from a little different angle. This year, I'm leading my church through the Gospel of Mark. My goal is for us to meet Jesus and to know him personally and deeply. To be "apprenticed by Jesus" as Zach Eswine says. For that to happen, I'm seeking to slow down and soak up the book of Mark. Instead of getting into the Word, I'm wanting to let the Word get into me. If you'd like to join me (especially if you're a member of Oak Hill), try this approach to reading the Bible this year. Try reading through the Book of Mark on your own. Go at your own pace. When you're finished, do it again. And keep a journal. Meditate on what you read. Talk about what you read with others. In addition, if you are a member of Oak Hill, take the sermon note sheet with outline and discussion questions each week and walk through it with your spouse or a couple of good friends. Get into the Word ... and let the Word get into you this year. The purpose of this Bible reading schedule (shortened considerably from schedules that get through the Bible in one year) is actually to limit the amount of Bible we read daily. Reading quickly through many verses may not be as profitable as savoring deeply a few verses. So the aim of this schedule is not to read less, but to meditate more. You will also benefit from Dr. Johnson’s thoughts on the “what” and “how-to’s” of meditation. Many of you know that I've recently transitioned from serving as Family Pastor at LaGrange Baptist Church in LaGrange, Kentucky, to Senior Pastor at Oak Hill Baptist Church in Humboldt, Iowa. It's been a big change (thus the lack of blog posts! ), but God has been very good. We sense that He has us right where he wants us for such a time as this. Maybe the biggest lesson God is teaching me so far is that He's with me. He's given me the gift of himself - the Holy Spirit. I'm learning to rely on him more than ever as I remind myself that the help I need lives right within me. * The Holy Spirit gives me power to do things I cannot do on my own. So when I'm faced with circumstances that are beyond my wisdom, instead of thinking to myself, "I can't do this," I'm reminding myself, "I can do this, by the power of the Holy Spirit in me." What an amazing gift to ponder at Christmastime. The help of the Holy Spirit living within us. *Paul Tripp elaborates on this concept in his excellent DVD series called, "Portrait of a Struggle." ﻿﻿One of the most powerful ways we can strengthen the church and spread the gospel is through the verbal encouragement of others. As we stir up one another with our words, we remind one another of the Holy Spirit's work within us expressed through our unique gifts and strengths. Just this Sunday my wife and I had the opportunity to encourage a young lady who helped lead us in worship. We came up to her after the service and told her that her voice and her presence helped to draw our hearts to God. Isn't it amazing that God uses our mouths as a means of building up his church? And when the church is strengthened, its influence can spread outward into the lives of others. I think of Paul as he reminds Timothy to "fan into flame the gift of God" (1 Tim. 1:6). What a cool metaphor to mediate on. I picture you and me sitting down by a campfire and the fire seems to be burning out. I take a stick and simply move the wood around and perhaps put another log on top. In just a few moments, the fire begins to burn brightly again spreading so rapidly that we have to push our chairs back because of the heat and flames. That's what our words can do for others. They can stoke the fire of the Holy Spirit and his gifts within us to burn more brightly so that all can see his glory. So here's the challenge. When you witness the display of God's grace and gifting in someone's life, tell them. Point it out to them. Encourage them. And be specific. You never know how God could use your words as a way of stoking the fire of someone's life to make a significant impact for Christ's kingdom. I encourage you to prepare your mind for Easter by printing out these Resurrection Letters by Andrew Peterson. Too many years I’ve found that I have rushed from Palm Sunday into Easter morning, from palm branches to the empty tomb, without giving my mind and my heart over to thoughtful contemplation of the cross. If you can relate to my lament, then I hope you will join me as we turn our gaze toward the cross through the pages of this book. Here are the other chapters. "He (the high priest) can deal gently with the ignorant and wayward, since he himself is beset with weakness." I was struck with the reality that I am called to be a priest to my children. I am called to pray and intercede for them. And I am called to deal gently with them, even though they may be ignorant and wayward. Why? Because I know that I myself am weak just like them. When I get frustrated with my kids and their lack of maturity, I should remind myself that I am weak and immature too. When I can't seem to understand why they are so self-centered, I should remind myself of how often I focus on myself too. And when they purposefully rebel against me and my authority, I should remind myself that I have played the fool so many times and rebelled against my Father too. The many sins and weaknesses I see in my kids should only serve to be a pointer to my own. And when I'm brought low to humbly admit that, I can run to Jesus who had no weaknesses and yet continues to sympathize with me in my own. What an amazing high priest we have who deals gently with us - even in our ignorance and waywardness! May we follow his example in our parenting. Today I pictured my heart like a battlefield. I imagined myself sitting on a white horse with Jesus as my Warrior King going before me in battle. As the enemies of my flesh crowded all around me, Jesus charged ahead and fended off each one with his mighty sword. I thought of Revelation 19:11-16 and reminded myself that Jesus is a strong Savior who has rescued me from the power of sin and one day will rescue me fully from the presence of sin. Thanks be to God! God gave us our imagination. When appropriate, I encourage you to slow down, picture the truth of Scripture in your mind and fight against sin. Down through the ages, Christians have taught that we need to drink deeply from the fountain of God’s word and we need to savor its truths if they are to satisfy our deepest longings for greater intimacy with God and if we are to experience a greater healing of our souls from his hand. The purpose of this Bible reading schedule (shortened considerably from schedules that get through the Bible in one year) is actually to limit the amount of Bible we read daily. Reading quickly through many verses may not be as profitable as savoring deeply a few verses. So the aim of this schedule is not to read less, but to meditate more. I encourage you to download this Daily Bible Meditation Guide . You will also benefit from Dr. Johnson's thoughts on the "what" and "how-to's" of meditation. For too long I've been running this race in my own strength and I wonder why I can get so tired. I've learned that this life is as Eugene Peterson says, "a long obedience in the same direction." With that in mind, I want to slow down so I can fill up. I want to listen to God and reflect more on His Word. I don't want to try to minister to others out of a dry and empty cup, but one that is filled up and flowing out. I want to live a life of dependence on the Holy Spirit -- to press into him and his leading as a little child depends on his daddy for everything. I want to live with Spirit-empowered faith! Even Jesus himself depended on the Holy Spirit for direction - I want to follow his example. As a Husband - I want to continue to pray for and with my wife each night and read and reflect together on Spurgeon's Morning and Evening Devotions. I also want to take the lead in organizing more consistent date-nights. As a Father - I want to continue to do nightly, family devotions (going through Long Story Short this year). In addition, I want to meet with each of my children on his or her appointed day of the week to stay up 30 minutes later than their siblings to talk with them and read to them from a Christ-centered, age-appropriate, character-forming book. What are you asking God to do in your life in 2011? My gut tells me that some would rather pass over the baby at Bethlehem for the glories of the cross. It's easier to preach and easier to explain through propositional arguments. Generally, one would rather stand meditating on the sight of the cross than meditating on God as a baby in a feed trough. But there is something about God coming to us as a vulnerable, needy baby that reformed people especially need to think on. The God of glory needs us to change his diapers. He is as inviting and approachable as any baby we encounter. What do we do with that? The purpose of the manger was realized in the horrors of the cross. The purpose of his birth was his death. Or to put it more personally: Christmas is necessary because I am a sinner. And so, in order for us to see Christmas for what Christmas really is, we must first see how disturbing the Christmas message really is. Mahaney tells of an article written some years ago in WORLD Magazine by William H. Smith with the title, “Christmas is disturbing: Any real understanding of the Christmas messages will disturb anyone” (Dec. 26, 1992). Only those who have been profoundly disturbed to the point of deep repentance are able to receive the tidings of comfort, peace, and joy that Christmas proclaims. And so my prayer for you and me is that we would be filled with peace and joy this Christmas–because we have been disturbed by the God who was born in a manger so he could die on a cross for our sins. I'm a lot like Zechariah. You remember the story in Luke 1. An angel of the Lord appeared to him and told him that his wife would bear him a son named John. Though this was a messenger from God, Zechariah was not convinced. He said to the angel, "How shall I know this? For I am an old man, and my wife is advanced in years" (Luke 1:18). In other words, "I don't believe you. All I see is that my wife and I are too old to have a baby." With that, the angel, Gabriel, shut Zechariah's mouth and made him silent because he "did not believe [God's] words, which will be fulfilled in their time" (Luke 1:20b). In Luke 1:6, we see that Zechariah was a righteous man who walked blamelessly in all the commandments and statutes of the Lord. But he didn't always walk by faith. Here we see that his eyes were so fixed on his immediate circumstances--his age and the barrenness of his wife--that he couldn't see the unseen promises of God. It's ironic that God had to shut his mouth so he could see more clearly to walk by faith. I'm a lot like Zechariah. I don't always walk by faith. I like to know what's ahead. I like it when God gives me clarity and shows me the way. I'd rather not take steps of faith and trust him and his word. I'd like to see it first. I don't like to be led by something I can't see. But I suppose that's how God grows us. In the beginning of our Christian journey he gives us a pillar of fire to guide us through the wilderness of life. As we take steps on the journey he slowly takes away the pillar of fire that we can see so we would rely on the pillar of his promises that we can't see. But just like Zechariah (and the Israelites before him), God has given us his word and his promises to guide us. These unseen truths are the very things we must look to and cling to when we feel like God is not there. Because he is there and his word stands forever. Every promise is "yes" and "Amen" in Christ. So Lord, help me to lift my eyes away from myself to the unseen promises of your Word. 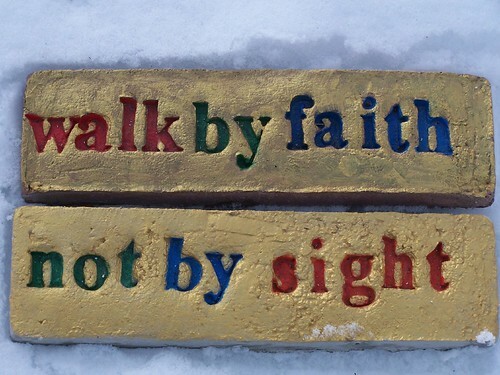 Shut my mouth if you must so that I may learn to walk by faith even when I can't see what's ahead. I consider myself to be a rather reflective person. Sadly, all too often my reflecting is not done in a spirit of thanksgiving. So, with the Thanksgiving holiday approaching, I had an idea ... and I commend it to you. First, read Psalm 9:1 which says, “I will give thanks to the LORD with my whole heart; I will recount all your wonderful deeds.” Take that in. Meditate on that verse. Next, go all the way back to the beginning of your life and recount all the wonderful things God has done for you. You may need to carve out some time for this. But go ahead ... take a long walk (might be a good thing before the big turkey dinner!) and just let the many memories of life pass before you. Think about each memory as an opportunity to thank God. Next, as you recount the many ways that God has showered his mercy on your life, think about how one experience or one person triggered another experience and another person that God has sovereignly brought into your life for His glory and your good. Let your mind become like a big mural of his grace to stand back and look at. Finally, meditate on the reality that you've only scratched the surface of the many mercies God has given you. It will take all of eternity to count the number of blessings in your life! For now, end in prayer and then go and share a word of thanks to someone whom God used to bless and impact your life.